Starfruit (a.k.a. carambola) has unique ridges down its sides, usually five but it can vary. In cross-sections, it looks like a star, which is where it gets its name. The fruit is about 2-6 inches in length, and is yellow when fully ripe. There are two main varieties of starfruit: the small sour kind and the larger sweet type. Starfruit contains several vitamins such as, choline, folate, lutein zeaxanthin, niacin, antothenic acid, riboflavin, thiamine, vitamins C, B6, and E.
It also contains trace amounts of essential minerals such as calcium, iron, manganese, magnesium, phosphorus, potassium, sodium and zinc. Anti-cancer: Free radicals and carcinogenic agents in the body may cause damage to cells that lead to cancer. Starfruit has a high content of antioxidants that may help clean the body by neutralizing free radicals before they cause too much damage. The high fiber content in starfruit also cleanses toxins that are stored in the colon and lowers the risk of developing colon cancer. Anti-inflammatory: Starfruit has high amounts of antioxidants and flavonoids which are beneficial to protecting from inflammation caused by free radicals that can cause tissue repair delays. Vitamin C pushes out toxins and helps in collagen synthesis which is an important component to repair and form bones, arteries and blood vessels. This is very important to healing the body and calming the damages that are caused at a cellular and tissue level. Breastfeeding: Some women have trouble producing enough milk to breastfeed their newborn baby. Instead of taking hormonal pills, starfruit has properties that may help to increase milk production naturally. Heart health: The potassium and sodium in starfruit are important contents of electrolyte and are useful for maintaining blood pressure. Levels of sodium are kept in check by magnesium which is a mineral that regulates the muscle function of the body including the heart muscles. Heart muscles create heartbeat and regular heartbeat that keeps a healthy blood flow. High sodium levels are dangerous and can increase blood pressure. The low fat content makes it a health food supplement and lowers the bad cholesterol which causes plaque buildup. Immune system, strengthen: Starfruit contains high amounts of vitamin C, which is a water soluble vitamin that is considered to be the best antioxidant available to the body. Vitamin C boosts the immune system to help ward off colds, the flu and other infections. Vitamin C is not stored in our body and is used pretty fast when we sweat. Antioxidants increase immune functions by riding the toxins and free radicals that take over our body due to the environment, internal metabolism and food sources. Skin: Free radicals and toxins are cleaned out of the body by antioxidants like vitamin C, the flushing of toxins created better skin and controls acne. Starfruit juice can hydrate and smooth skin, as well as reduce the appearance of wrinkles. Weightloss: Starfruit is low in fat, high water content, contains high amounts of minerals and fiber. It makes a great snack for weight management dietary routine. The high content of fiber makes you feel fuller for longer and naturally curbs your appetite. Water-rich fruits keep you well hydrated when exercising and the healthy mixture of minerals keep your electrolytes in balance. Electrolytes manage the neuro transmission and control muscles function in the body. Choose starfruit that is yellow, shiny, without bruise and not too soft. Ripe starfruits should be consumed as soon as possible, they don’t keep for long. 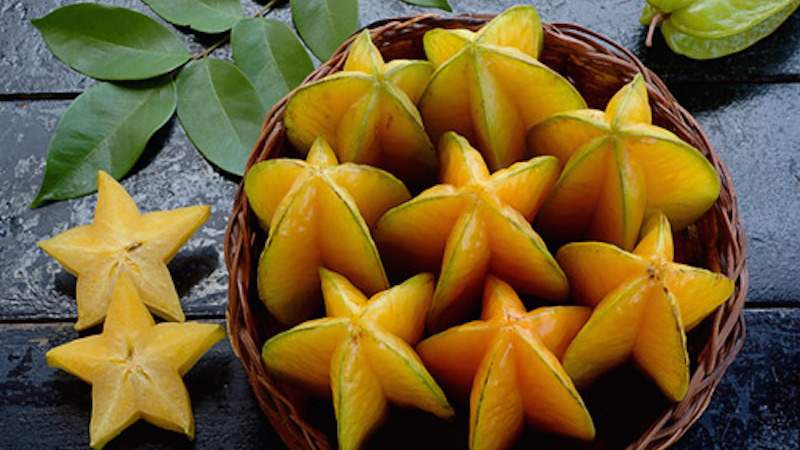 Starfruit is delicious sliced and eaten alone, juiced, or added into salad. Starfruit contains caramboxin and high levels of oxalic acid. These substances may be harmful to individuals who have a history of kidney problems, or those undergoing kidney dialysis treatment. Individuals suffering from kidney failure can experience hiccups, vomiting, nausea, and confusion. Like grapefruit, starfruit may interfere with certain drugs. If you are on any medications, it is not recommended to consume starfruit or drink of its juice.